This is a simple dry curry made with soya beans. It is more like a sundal and can be had as a tea time snack. Soya beans is very high in dietary protein (in fact highest among all legumes) and fiber. Soybeans are also an important source of the minerals copper, manganese, molybdenum, phosphorus, potassium, vitamin B, riboflavin and omega-3 fatty acids. They are rich in Vitamin B12 which is not found much in other vegetarian foods. Moreover it is low in starch and devoid of cholesterol. This curry is quite filling, delicious and also very nutritious. 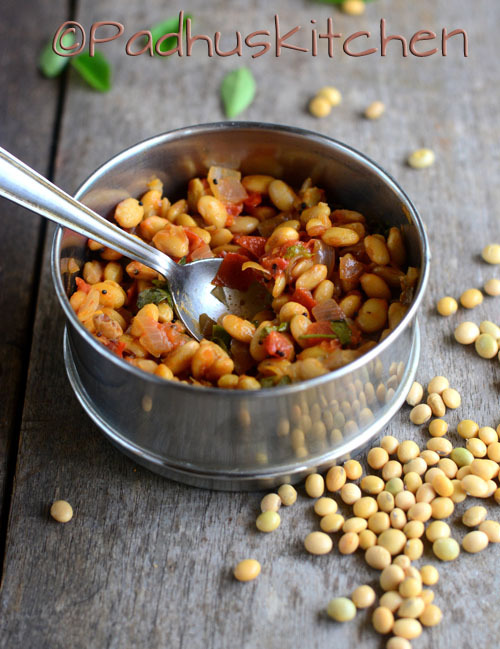 Today we will learn how to make soya beans curry following this easy recipe. How to cook soya beans? - Wash and soak dried soya beans overnight or for 8-10 hours. Drain the water, rinse and discard any hulls (outer skin) that has come off. Pressure cook the soya beans adding little water and salt needed for 5 whistles or until soft but not mushy. I kept the beans in a vessel and then pressure cooked. If you find hulls that has come off after cooking, you can discard it. Now the soya beans is ready. We will make protein packed soya sundal or soya beans curry. Chop onion, tomato, ginger, garlic and green chilli finely. Heat oil in a pan/kadai, add mustard seeds, when it splutters, add urad dal, hing and curry leaves. When dal turns golden brown, add finely chopped onions, ginger, garlic and green chilli. Saute until onion turns transparent. Add finely chopped tomatoes, chilli powder, turmeric powder, coriander powder, garam masala, salt needed and saute until tomato becomes mushy. Add the cooked soya beans, mix well so that it is well coated with the masala. Cook covered for 3-4 minutes. If it is too dry, you can sprinkle water and then cook covered. Garnish with coriander leaves and serve hot as a snack or as a side dish for rice. Ashwini - Yes you can. In that case, you do not have to soak overnight. You can cook in a pan or pressure cook for just 1 or 2 whistles.